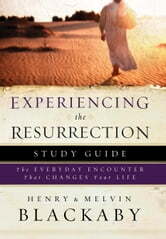 The study guide that will help you experience the powerful reality of Christ’s resurrection. Moment by moment, day by day. What does the resurrection of Christ really mean for us? What does it reveal about the heart and mind of God? And what real differences can the miracle of the resurrection make in your life today? Discover answers to those and other questions as you examine God’s Word with this companion study guide to the book Experiencing the Resurrection by Henry Blackaby and Melvin Blackaby. Packed with practical notes, advice, and questions for reflection, this highly interactive guide—ideal for small group or individual use—shows you how to witness Christ’s resurrection in and through your life. Each chapter of the book is explored in a flexible one-week format with “life change objectives” that arise from applying the truth for each day to your life.